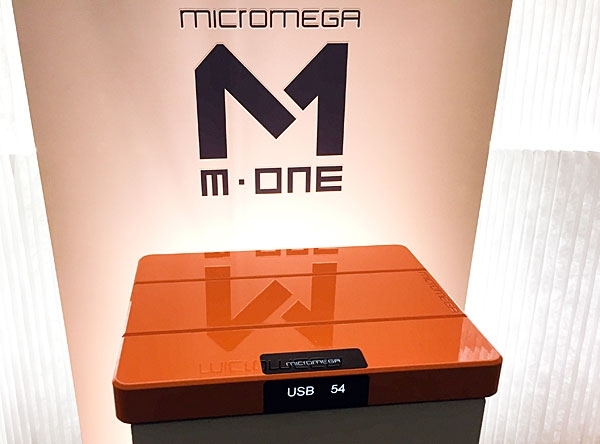 One of my favorite new digital products, from an industrial design point of view, is the new all-in-one system from French company Micromega, designed by Daniel Schar. Assuming you have a nice flat place to put it (flat or on a wall), you can request a custom finish or go with standard black or bright orange as shown in the photo. I've recently had a great run with Chord products in my system including the Hugo TT DAC and now the small-sized Mojo (mobile joy) headphone DAC. On the opposite end of the spectrum from the Mojo is DAVE which the company says is the most advanced DAC they've made so far. Here are a couple photos of the two products in the Lenbrook (distributors of NAD, PSB and Bluesound) suite that included MQA. 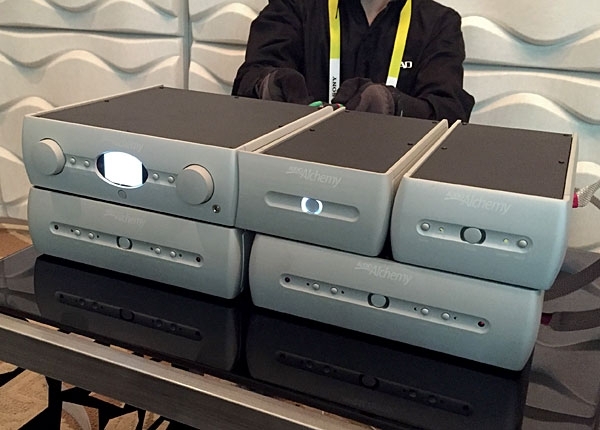 Above is the Bluesound Vault 2 streamer and CD file ripper ($1,199) and below the NAD M12 Preamplifier/DAC ($3,499). 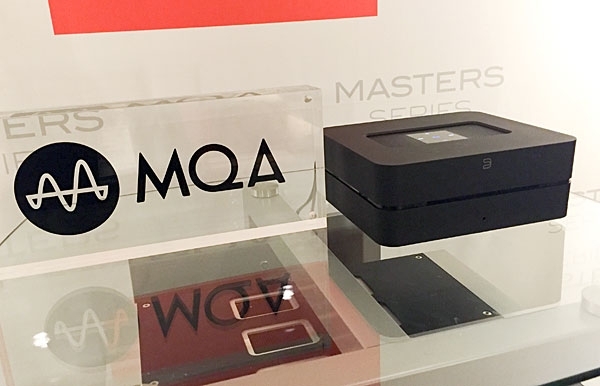 Both units on display include the necessary firmware and software to decode MQA files. 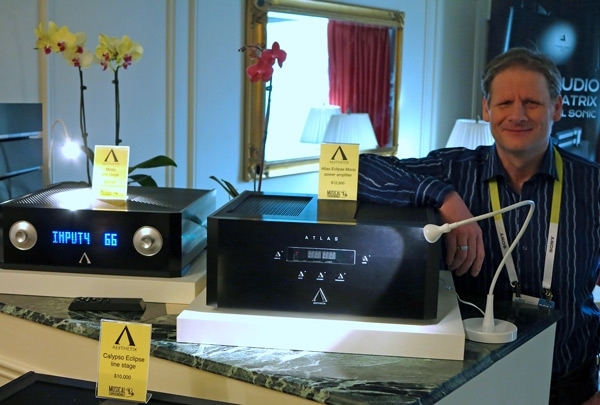 Aesthetix's Jim White (above right), along with the company's distributor, Garth Leerer of Musical Surroundings, showed off the new, Aesthetix Saturn Atlas Eclipse monoblock amplifier ($25,000/pair). An evolution of a product first launched 10 years ago, the Saturn Atlas Eclipse sports super-matched output devices that effectively lower noise by 40%. 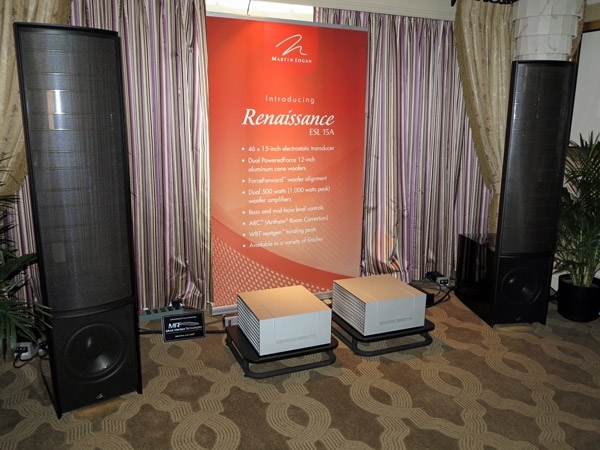 Boldly proclaiming that its new the Renaissance ESL 15 A ($24,995/pair) combines a 45" x 15" electrostatic transducer with dual 12" aluminum-cone woofers, dual 500W woofer amplifiers, bass and mid-bass level controls, and Anthem room correction, MartinLogan proceeded to mate it with excellent Constellation Audio amplifiers and MIT cabling. 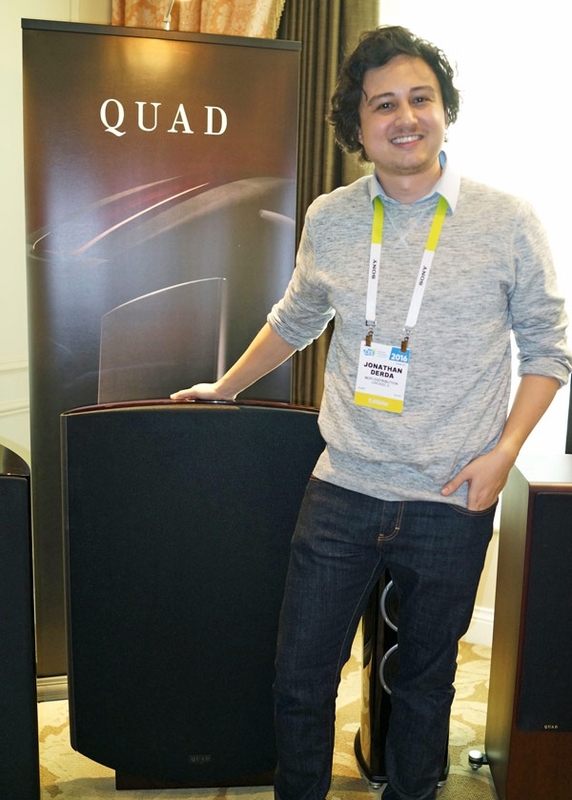 "It's the only loudspeaker under 6 figures with a beryllium midrange diaphragm," Paradigm's Erin Phillips told me about the Paradigm Concept 4F (price not set, but expected to be under $40,000/pair), a speaker that has been forthcoming since last May's Munich High End, and probably won't arrive until late summer/fall 2016. The Canadian-crafted, full-range loudspeaker combines four powered 8.5" wooferstwo front-firing and two rear-firing in "vibration-cancelling configuration"with passive TruExtent® 1" beryllium-dome tweeters and 7" midrange drivers. Now this is an interesting one. 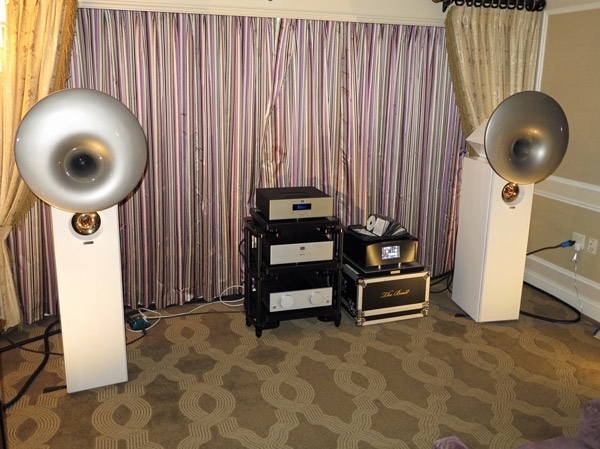 Using the same Dan D'Agostino Momentum monoblocks ($65,000/pair) as in the Wilson Alexia/dCS suite in the Mirage, albeit with the new case work; the same dCS Rossini player ($28,499) and Rossini Clock ($7499) as in that room, and whose sound I know quite well because I've spent considerable time with the player in my own listening room; an even higher Opus level of Transparent Cabling than in the Wilson/dCS suite; and the not too shabby Dan D'Agostino Master Audio Systems Momentum preamplifier ($32,000), EgglestonWorks' Ivy Signature SE Reference Series loudspeakers ($155,250/pair) made an entirely different impression. I've been variously enamored and critical of the sound of Acapella loudspeakers and electronics on previous occasions, but here, in a space I would have considered too narrow to be optimal, the German-handmade Acapella Cellini ($55,000/pair) sounded excellent. 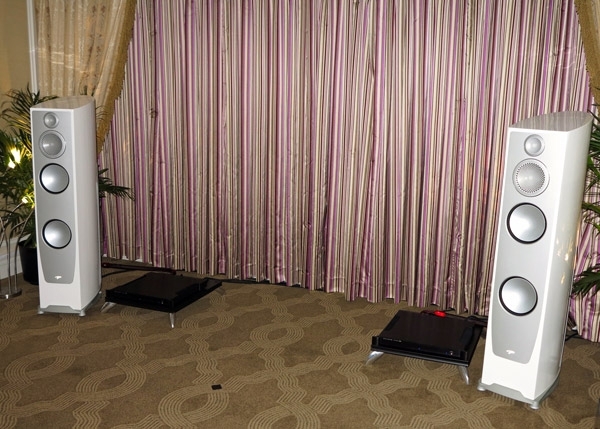 Never before shown at a US show, the Cellini stands out due to its hyper-spherical midrange horn. (The Acapella Violin, for example, has a spherical horn.) It also has Acappella's TW1 ion tweeter, and claims an overall frequency range of 28Hz40kHz , and a sensitivity of approx. 91dB/W/m. Shipping in the second quarter of 2016, Meitner's extremely powerful MTRX2 1kW monoblock amplifiers (price around $80,000/pair), which output 600W into 8 ohms and 1000W into 4 ohms, may be the weaker siblings of their flagship MTRX predecessors, but they have their own proprietary topology to make them feel their equal. The picture shows the inside of Nagra's new HD Amp, whose 6 output devices are specified as driving 270W into 8 ohms, 1kW into 2 ohms. 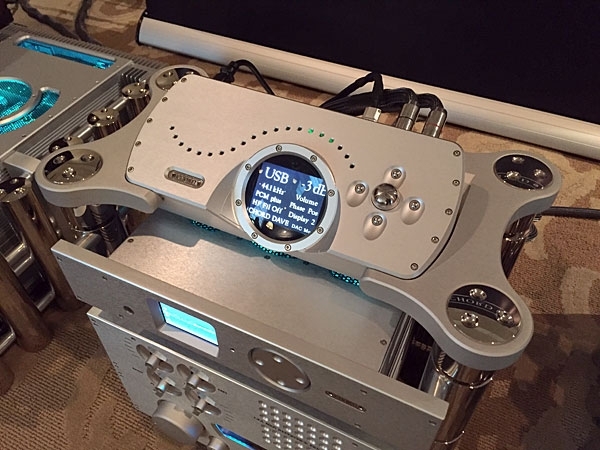 The HD Amp was on passive display, but Nagra's all-Nagra component chain, feeding Wilson Audio Sabrina loudspeakers, made quite a favorable impression. 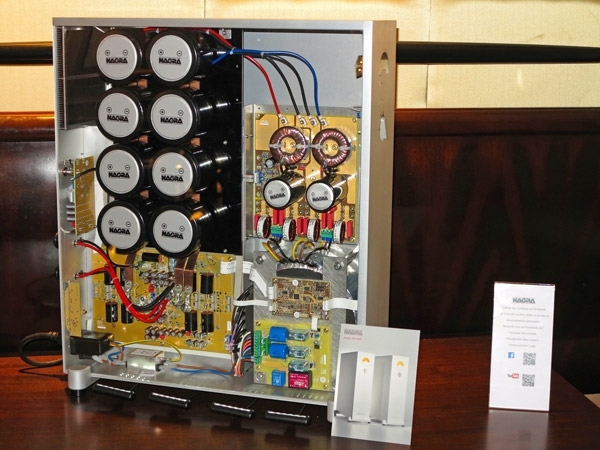 VTL Amplifiers, Inc. introduced the $3000 TL-2.5i Performance Preamplifier at CES 2016. 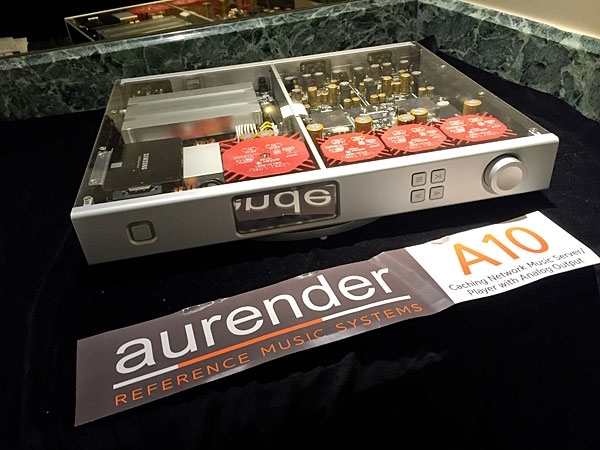 It features 6 line inputs, an optional $2000, internally retrofitable phono stage, two pairs of outputs, and a tape loop. Scientific Audio Electronics (SAE), founded in 1967, has been out of business for decades. Recently, Morris Kessler of ATI, manufacturers of the ATI and Theta brands,helped restore the company. 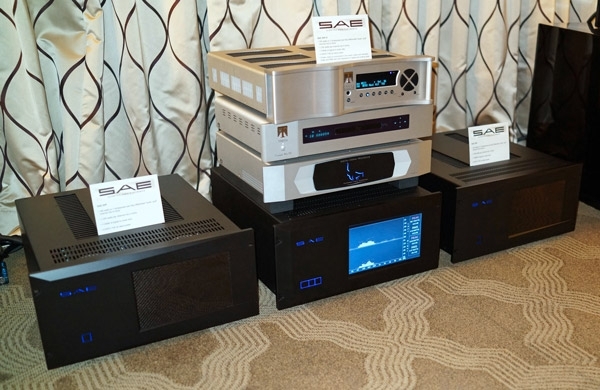 At CES, Bill Skaer, National Director of Sales, presented the firm's latest amplifier, the 125 lb, SAE 2 HP-D Display version ($19,995). 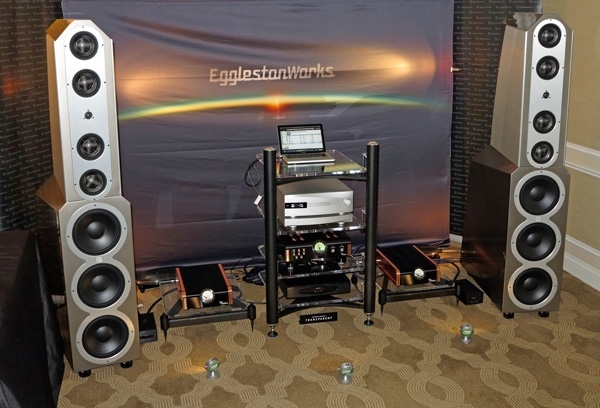 Quad electrostatic loudspeakers have been unavailable in the United States retail market for the past few years because there has been no importer. 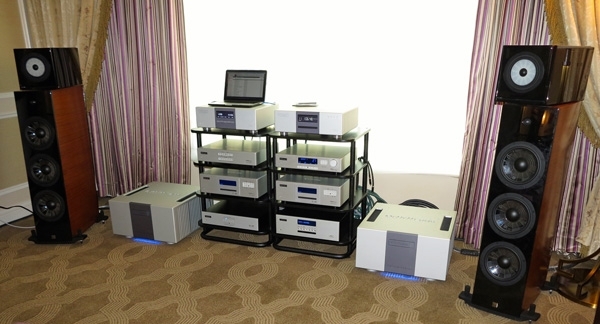 In the past 12 months, MoFi Distribution has stepped up to develop a dealer network and provide service. Jonathan Derda, Mo-Fi's National Sales and Marketing Manager, described the new service center in Fairfax, Virginia that will service all vintages and versions of the loudspeaker.